I have a bit of a book club going on with my best friend Sam and my cousin Michelle (whom I refer to affectionately as Mush). Mush lives in California so she writes down lists of books that Sam and I should read and sends them to us. When she does this, I immediately log in to my Kindle Store and download samples of every book to my Kindle. With Sam, it’s a bit easier. Whenever her and I get together, there is often a stack or two of books exchanged between us, Sam giving me her latest reads that I have to get through, and me doing the same. Needless to say, I have a bit of an overflowing bookshelf at the moment. I have always been an avid reader. Growing up, my parents read to me, usually every night before bed at the very least. As I learned how to read on my own books became a fixture in my life. I quickly became that kid who went to the library and took out the maximum number of books only to return them, finished, a week later and take out some more. Throughout our school years, Mush spent her summers with me. We spent hours every day laying on a blanket in the backyard, a stack of books beside us, until we were called in for dinner. After dinner, we would go to my room and get cozy with even more books until my mom would see the light on under the door in the wee hours of the morning and tell us to go to sleep. The next morning we would beg to be taken to the library or Costco (cheap books in bulk, particularly Nancy Drew and the Hardy Boys, our favourites!) and the cycle would repeat. Even all of these years later I still read books as if they’re going out of style. Time isn’t as readily at my disposal due to a little something called “adulting”, and I do go through dry spells where I get distracted by some other hobby or life in general. But in the end, I always come back to the books. At the beginning of this year I made a goal on Goodreads to read 50 books over the course of 2018. With my book club in mind I knew that I would have no problem having enough books to fill the year with. I started strong by finishing about a book or two a week for the first couple of months. Then I got distracted by Netflix and forgot about reading for a while. At the beginning June I looked at my reading goal and realized with dismay that I was barely one-third done with my goal and the year was already half over. My husband and I were just about to get in our van and travel for the summer so I grabbed my Kindle and a stack of five books thinking that it would be enough to get me through the summer and I would have to just admit failure in my goal. 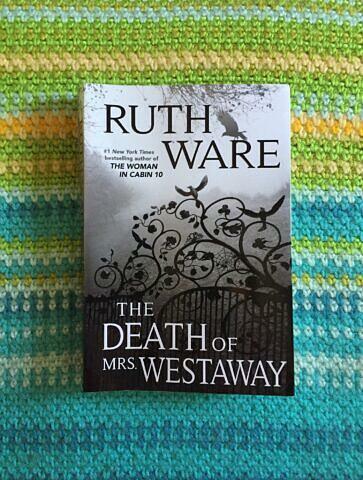 The first book I finished after not reading for a long time was “The Death of Mrs. Westaway” by Ruth Ware. I was introduced to Ware by Sam who lent me “In A Dark, Dark Wood” last year. I read that book in an entire sitting, late into the night and knew I had to get more of the author’s books. Not too long after that I finished “The Woman in Cabin 10” and waited patiently for “The Lying Game”. “The Woman in Cabin 10” was another great mystery and I liked it even more than the first book. Unfortunately “The Lying Game” was a disappointment that I couldn’t wait to get through. When the new book was announced I didn’t let my past disappointment turn me away though and pre-ordered it as soon as I could. “The Death of Mrs. Westaway” was a fantastic recovery after “The Lying Game”. The book is about a young woman, Hal, who receives a letter informing her that her grandmother has passed away and inviting her to come to the wake and get the details of her inheritance worked out. Hal is, of course, confused as she knows that Mrs. Westaway is not her grandmother. But, being strapped for cash, and in a bad situation with a money-lender, she decides to go and pose as the heir and claim the money. As things progress, Hal begins to learn more about the family and the more she learns the more confused and disturbed she is. Somehow she is in fact tied to this family, but she isn’t quite sure how. Her new-found relatives are very strange, and something is not right with her grandmother’s house and legacy left inside it. Hal quietly digs deeper and as she does, the story unfolds in a very Agatha Christie way. I really enjoyed this book. The story was told very well and the plot and characters were very interesting. My favourite part of the book was the way it was written. The book is set in modern day, but the setting of the old gothic-Victorian manor and the way the characters act and speak with an air of wealth and sophistication made it feel like the book was set in that era. I felt the this was well-executed. I was constantly having to remind myself that it was not a Victorian-era novel but present day, and this combined with the bleak, wintry setting put my mind in a bit of a fog that made the plot more mysterious while at the same time swallowing me into the story. My only complaint is that the resolution of the mystery didn’t have enough build-up or ground-work for the particular solution the author provided. But, that in mind, I feel that it did work and didn’t take away from the book as a whole. Reading this book left me wanting more, but unfortunately the author doesn’t have anything else out at the moment that I haven’t read. So, after I finished this book I tackled my stack of books and finished ten books in the last month and am almost halfway done my goal for the year. I guess I’ve got my groove back! Sorry, no other posts matched this category.